Oyoko Roman Catholic Kindergarten and Primary School is in dire need of educationally friendly school buildings. 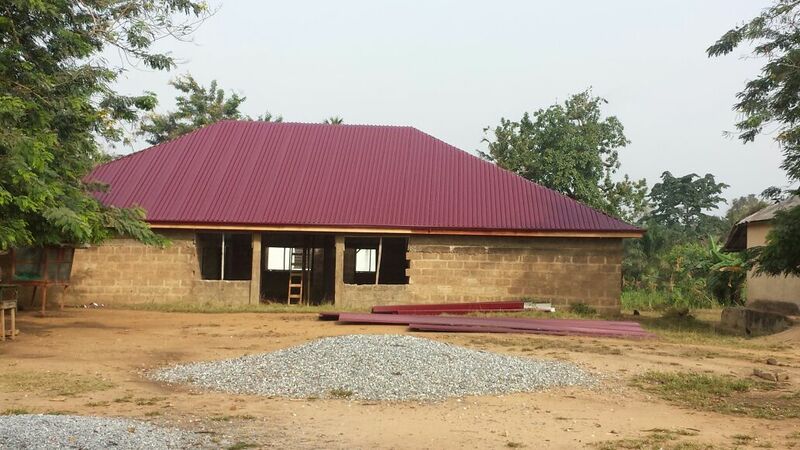 Due to your donations, the first phase - roofing - of the school building is completed. We are hopeful that we will receive enough donations to complete the project - wiring, windows and doors, plastering, and eventually painting. May the Lord Bless You for Your Donation! The children of the school need help because the old school building is too horrible for adequate use. The old structure lacks windows and it is so weak that it is falling apart endangering the lives of the school children and their dedicated teachers. As stated above, the PTA has started a new school building and needs some funds to complete it. Per text messages, the secretary of Oyoko Roman Catholic School noted that they need the equivalent of $12,000 to complete two new buildings, and to demolish the old ones. 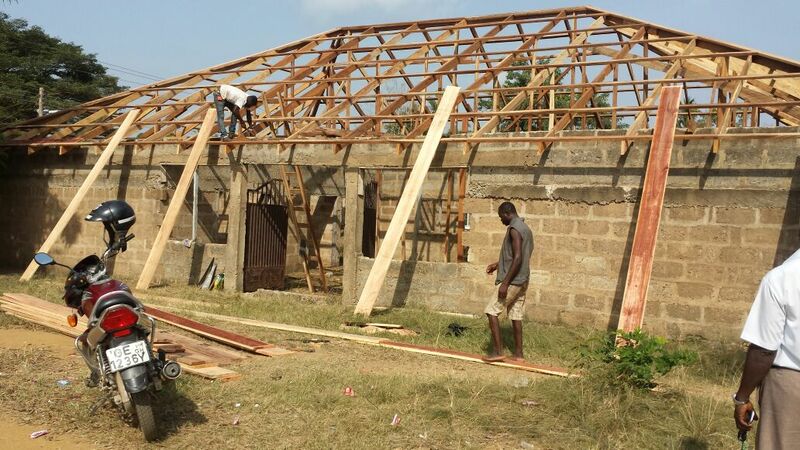 We hope that you will be able to assist the Oyoko Roman Catholic School to complete the school buildings. Thus, we are appealing to all generous people to donate funds for the noble cause of providing school buildings for the children of Oyoko. We rely on the generosity of Churches, individuals and businesses for support. 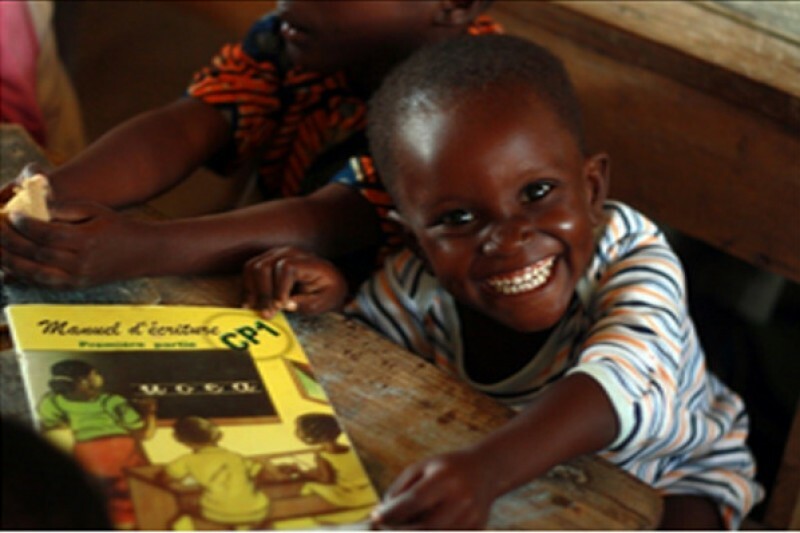 Your generosity will make a huge difference in the lives of the children of Oyoko. Please remember that every donation makes a difference, regardless of the amount. This is to formally thank all those who donated funds to complete the school building. Yes, due to your donations, the building is completed and in use. Your generosity has made some children very happy, and I know that you are happier for assisting these children. May all your goals be achieved! 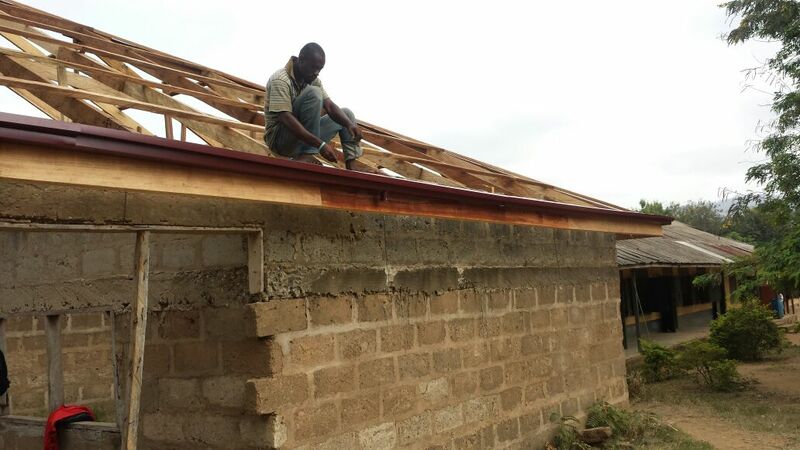 This is to inform our donors that the school building will be roofed in February/March this year as we are confident of reaching the $5,000 needed for the roofing by end of February. I want to thank all those who have donated to this important project. Though we are far behind our goal, we know that eventually we will reach our goal. In an earlier update, I noted that on collecting $2,000 the amount would be handed over to the officials at the school. However we changed strategy. After meeting with the officials of the school, we decided to wait till we have collected $5,000 because that is the amount needed to put a roof over the school - the first stage of the project. Thus, since the $2,000 is not enough to roof the building it was not necessary to hand over the amount to the school officials. It is our hope that we will raise $5,000 by January 2017. Recently, after heavy rains at Oyoko township, several parts of the town were flooded. Fortunately, the Roman Catholic school was not affected. Some of the people behind this campaign turned their attention to alleviating the hardship that the flood brought upon the people. In consequence, our campaign slowed down a little bit. With the flooding behind, we are back to concentrating on the school building, and we are confident that you will assist us. Please spread the campaign message. This is to formally thank all those who donated funds to complete the school building. Yes, due to your donations, the building is completed and in use. Your generosity has made some children very happy, and I know that you are happier for assisting these children. May all your goals be achieved! It is great to hear that the school is being commissioned soon. Thank You to everyone who donated!